Wanna Buy Some Play Chips? During the Hard-Boiled Poker Home Games on PokerStars last Sunday, I drew attention to a new text link appearing up in the left-hand corner of the play money games on Stars. As pictured to the left, one can now actually purchase play chips -- for real money -- directly from Stars. Being stuck here in the U.S. and still a great fan of the PokerStars client, I will jump on the site and join play money sit-n-gos every now and then, even apart from the HBP HGs. Playing for play chips is how I first got started with online poker, and indeed for many months played nothing but play chip games until finally making a first deposit and moving over to the micros. Play money cash games are mostly tedious -- to me, anyway -- mainly because players are so understandably erratic and there isn’t a lot of genuine competitiveness on display. Sit-n-gos and multi-table tournaments also feature a healthy helping of goofiness, but they tend to be played more straightforwardly (even if not that skillfully) which thus makes them mildly interesting and even worthwhile to some extent (I’d argue) for new players. When I first started with the play chips I managed to build up a “roll” (as it were) and in fact had a couple of million in there by the time I started playing the real money games. I remember at some point shortly afterwards becoming aware of the existence of a real-money-for-play-chips market and even looked into trying to sell my play chips for cash. This was an actual phenomenon at the time -- I’m talking pre-UIGEA, say 2005 or so -- with play-chip purchasing websites and everything. No shinola. If you go back and search forums of the day, you’ll see a plenty of talk about such deals actually being made. You’ll also find people discussing getting scammed out of play money chips, which seems like a meaningless ploy unless the scammers were then able to turn the play chips into cash by some other means. I never did look into it deeply enough to try to sell any play chips, although I kind of remember rates of something like $11 for 500k or a million (or thereabouts). I also recall stories of some folks starting their real money rolls this way. Microstakes master Nathan “Blackrain79” Williams -- whom I interviewed for Betfair Poker some time back -- is an example. Nathan tells the story on his blog about selling 5 million play chips for $60 back in ’05. 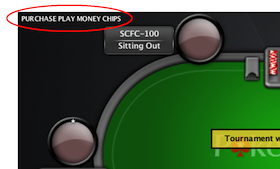 Clicking on the “PURCHASE PLAY MONEY CHIPS” link in the Stars client carries you to a “Play Money Cashier” page. 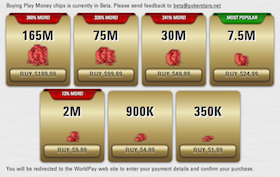 There you’ll find options to buy 350,000 play chips (for $1.99) on up to 165 million play chips (for $199.99!). Again, no shinola! I guess stepping back this is one of those “nothing to lose” ventures from PokerStars’ perspective. Kind of an interesting experiment, I guess, which recalls other “conversion” strategies with free-to-play games (e.g., on Facebook) that have ended up becoming significant revenue-makers. Meanwhile, I am noticing these days some 1 million play-chip buy-in SNGs -- something I don’t remember there being back in the day -- for which I guess one really should have 100-plus million play chips in the ol’ play money account to join. You know, if one is practicing sound play bankroll management.